So now we're locked in a game of "what's that gonna be?" with savory, borage, chervil (right), sorrel, dill, parsley. The chives we can figure out. 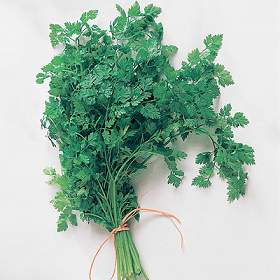 A bit of studying shows that chervil and savory are prized in French cuisine. 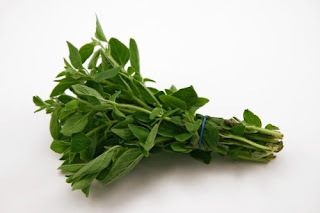 Savory looks a little like thyme, so that should be easy to identify; the chervil looks like parsley, so that'll be down to a taste-test. We'll send out a call for volunteers as soon as the plants are big enough to be nipped on. The way the .... sorrel? is growing, that really shouldn't be too deep into the summer. There's also a massive patch of ... chervil? that will provide some lovely seasoning... once it's determined what exactly it's best suited for. Also discovered: the oregano established 15 years ago was apparently the only plant to thrive during Alabama's record drought last summer. It's everywhere. By the time it fills in fully, it will cover a patch bigger than our kitchen table. Who knew? An endless fountain of pasta sauce for the freezer could be on the horizon. Lavender also got a big boost from last summer's dryness. The bees have been playing in it, as well as the rosemary, apples, blueberries and pears blooming in our back yard. Somewhere, some beekeeper owes us big for a load of gourmet honey.